First, the college students who struggle with with algebra are usually the same folks who struggled with algebra in high school, only older now. They hated it then, and they dread it now. It didn’t make sense then, and it still doesn’t. So they are already predisposed to struggle with this class from painful past experiences. Another problem stems from the vocabulary of algebra. The words that are used to describe algebra are — let’s face it — intimidating! Words like: polynomial, quadratic, radicals. This is a specialized language, written in annoyingly polysyllabic Latin. And when you start to dislike a subject it is natural that you start to dislike the vocabulary of that subject. And the vocabulary of algebra is somewhat remote and cold, easy to dislike. “The difference between two integers is defined as the absolute value of of the difference of the absolute value of the integers.” I mean, all you’d have to do is pull out a match. It will virtually light itself when placed next to this kind of prose. The final reason has to do with the teachers who taught algebra back in high school. Now I am not picking on all teachers, but the ones I hear about over and over in my tutoring are those that droned on and on, “Then you subtract 17 from both sides, and finally you divide both sides by 3 …” just like the textbooks, never trying to make the ideas come to life. If you have a great algebra teacher, that can make the textbook bearable. But if the teacher is as dry as the textbook, it can be impossible for some people to make the critical connections. So what is the solution? Good teaching in high school, and great teaching in college can make a huge difference. For students who don’t have access to great teaching, however, there is my book, the Algebra Survival Guide. As a tutor who has worked with hundreds of high schoolers and scores of college students, I know how hard these students try, and how little progress they sometimes make. So I wrote a book in plain English, a book everyone can read as easily as you’d read a good novel. My goal was to take the edge off of the intimidating quality of algebra, and from the emailed responses I’ve received, it has worked. I also threw some humor into the book. O.K., I’m not Jack Benny, but I do make a few jokes, here and there. I mean, we all need to have a little bit of fun, even doing math. And I worked hard to connect the ideas of algebra to real life, to make them make sense. For example, take the problem of – 8 + 3. I liken this situation to a tug of war. There are two teams in the tug of war, a Positive Team and a Negative Team. The – 8 means that the Negative Team has 8 people pulling. The + 3 means the Positive Team has 3 people pulling. All you have to do to solve the problem is answer two questions: first, which team will win, if everyone is equally strong? The Negatives, since they have more people pulling. And then, by how many does the larger team outnumber the other smaller team? By 5, since 8 is 5 more than 3. Put your answers together, and you’ll see that the Negatives win by 5, so the answer is – 5. See how easy it can be when you relate the concepts to real life? 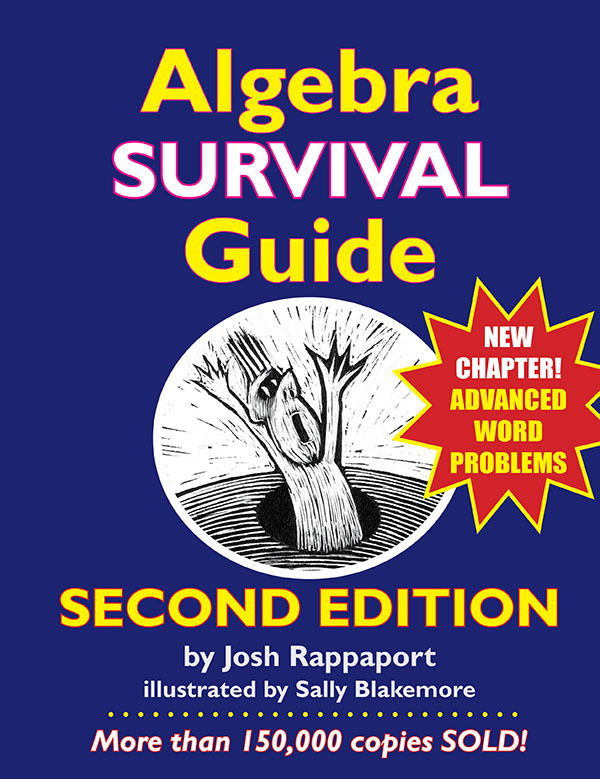 The Algebra Survival Guide explains many ideas this way, and it gives algebra a friendly human face. I’m a returning college adult now in the 4th week of my College Algebra course. Your book has FINALLY filled in the gaps in my earlier education … thank you (to the third power)! Thanks for the great book … 30 years of math phobia gone in 3 hours of reading … really, thank you very much! If you’d like to check out this book, just go to this Amazon page,where you can read lots of reviews. While you’re @ Amazon, don’t forget to check out the companion Algebra Survival Workbook, with thousands of additional practice problems, which take you from understanding to mastery. You’ll find that page here.